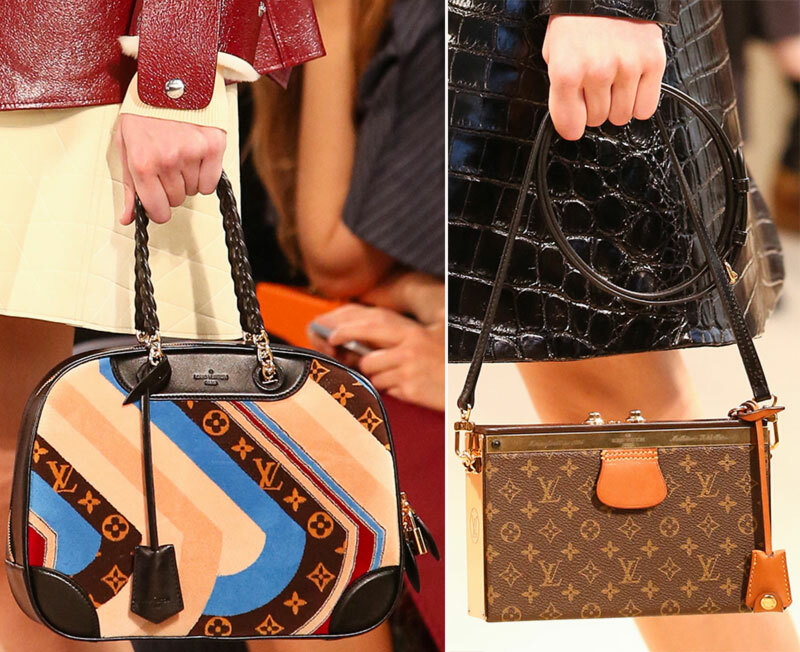 Personally expressing his gratitude and joy, Louis Vuitton’s new creative chief, Nicolas Ghesquiere, made sure every seat in the audience carried one of his typewritten notes where his described his above-mentioned feelings. I, on the other hand, watching and going through his designs from the comfort of my own home, felt like timetraveling from centuries past to post-modern fashion. 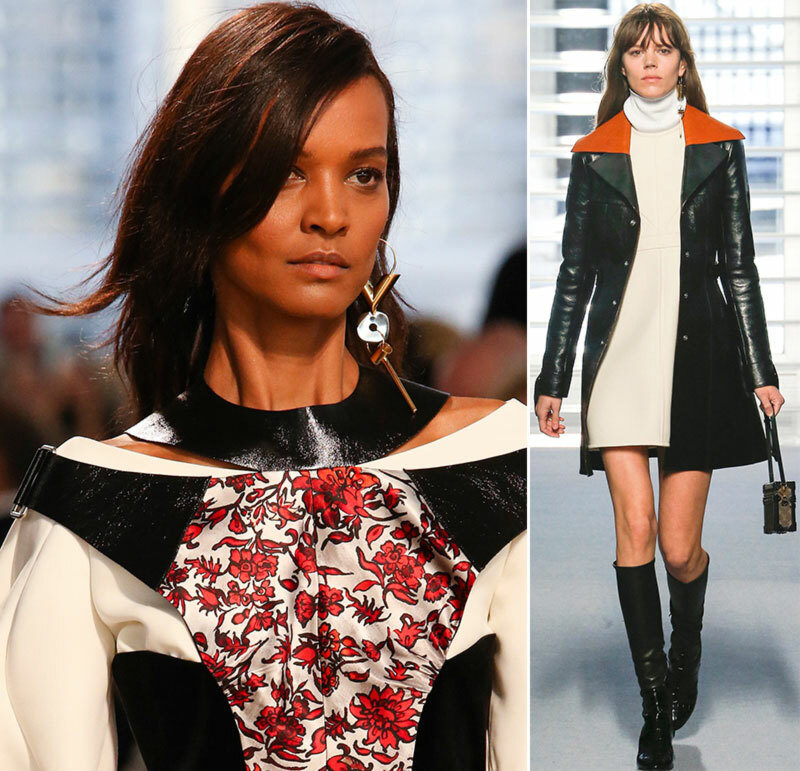 Reinvention, covers, redesigns, Ghesquiere’s ‘new day’ has strong past flavors. 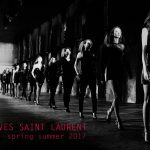 I’m oh-so-thankful for him bringing back on the catwalk two outstanding models: Freja Beha Erichsen and Liya Kebede. 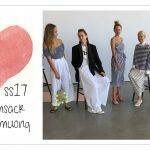 Years ago, when we were assisting at the ruthless emancipation of pants into leggings, I was hardly foreseeing a future for this second-skin pants. 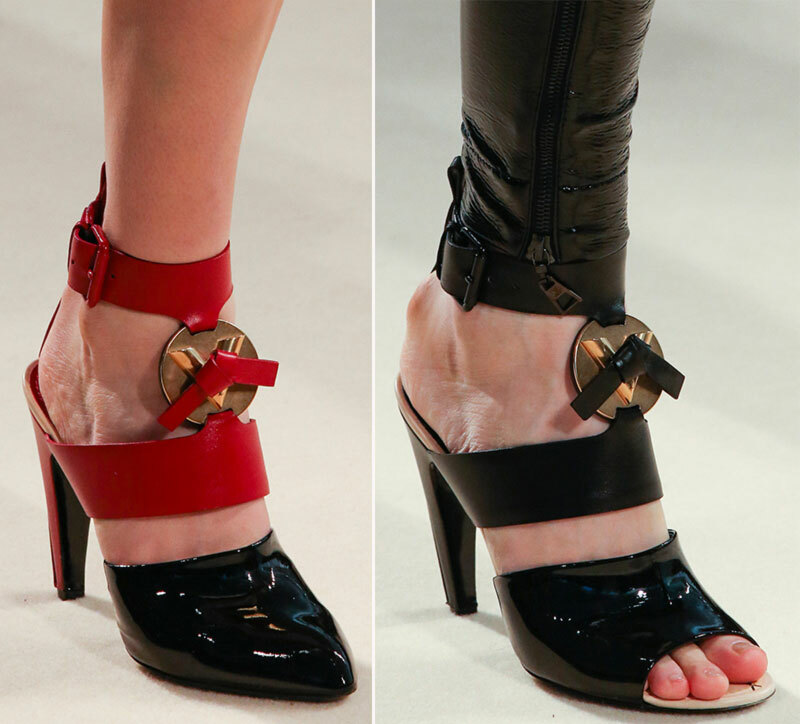 Now, almost a decade later, not only they’re still around, but also a steady catwalk fixture. 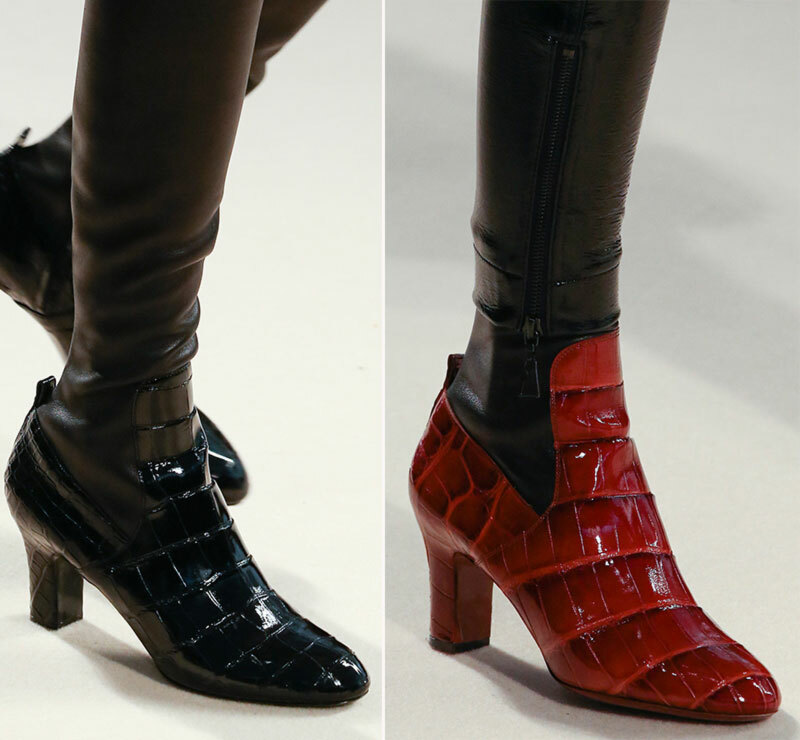 There was also a lot of leather and a lot of texture roleplaying in Ghesquiere’s first 48-looks collection for Louis Vuitton. 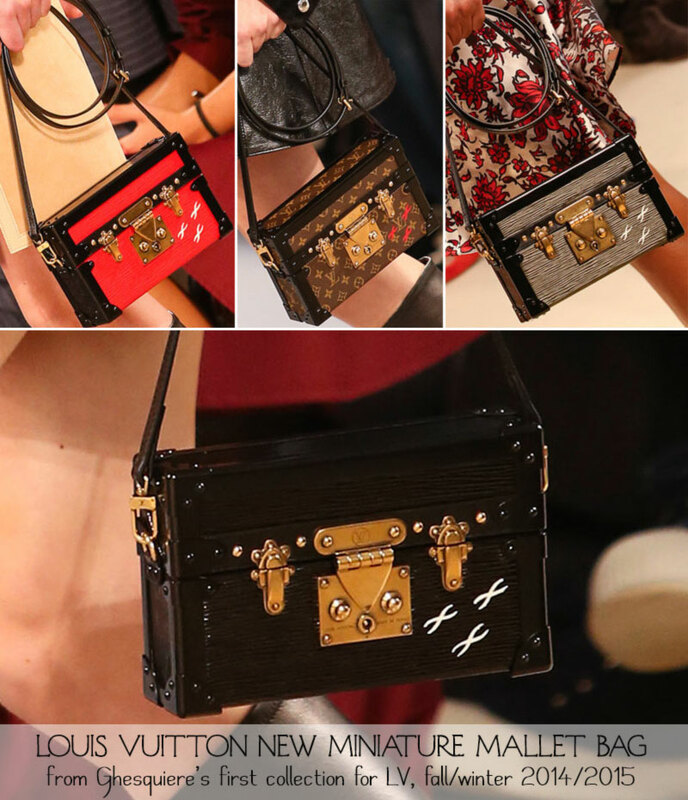 Rough around the edges and significantly smaller than her older sister, Vuitton’s legendary Mallet (carryall) downsized from a long series of extremely successful luggage in the maison’s history. It should most definitely hit a best-selling note even in its miniaturized state! 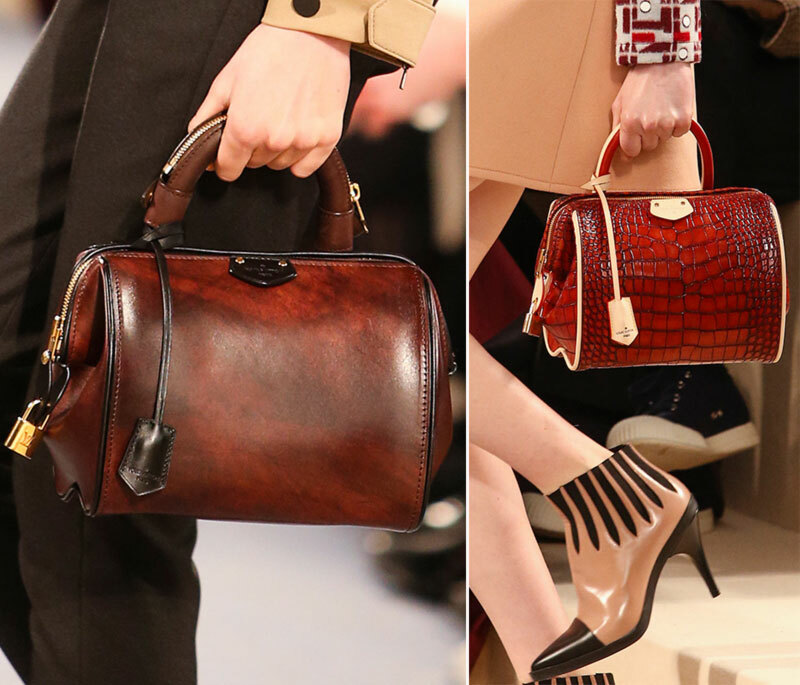 Wearing it with or without the chain strap seems to be playing out as the new bag trend. 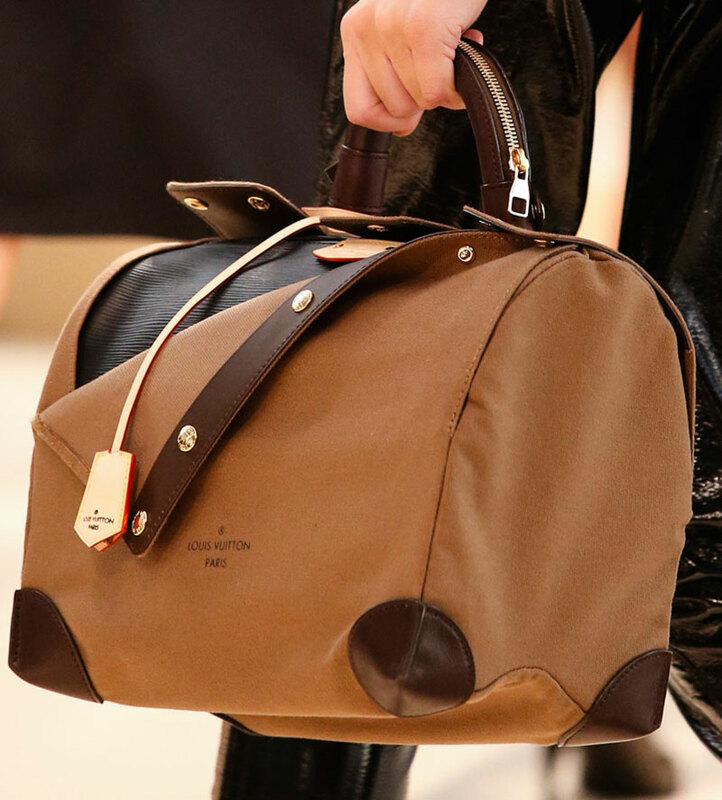 The most important innovation, however, was the ‘peeling-out’ leather, folded on one side, to reveal the boxy silhouette of the bag liberated and ready for its new day. 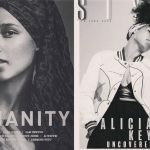 Its new era! Ghesqueire’s era! One of my favorite bags, a staple in my closet (as it should be in everyone’s closets), the roomy, androgynous weekender bag looks so posh and precious in Ghesquiere’s vision that it would be painful to rug it out in old dusty trunks or even put its fitting capacity to test by overpacking for weekend fun! 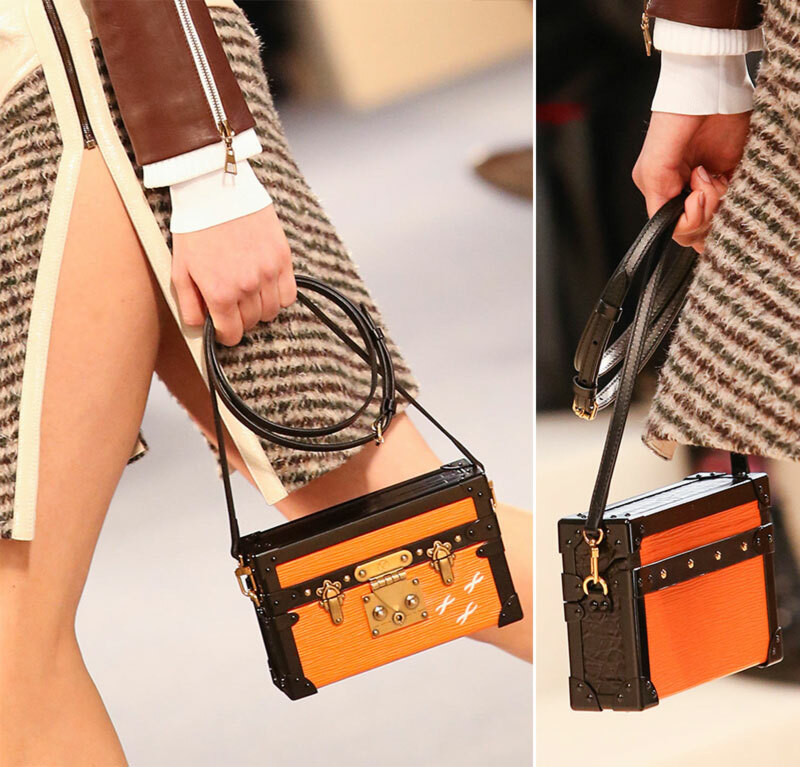 I fell madly in love with the handle zipper detail! At this point I’m uncertain if it’s just a design thing or it also hides an important feature, but from my comfy seat, it looks amazing! 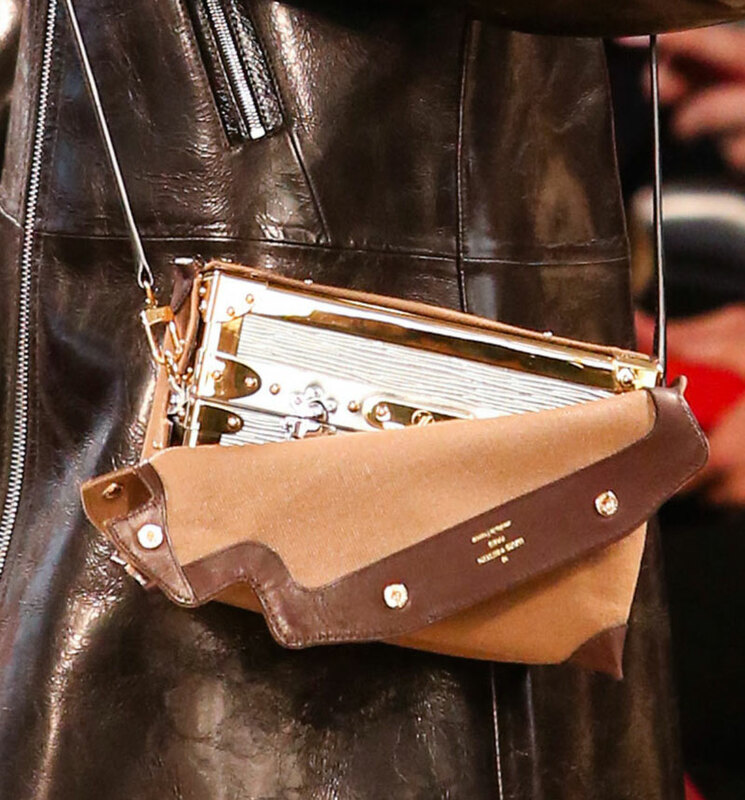 See also: More retro designs for Fall 2014 from Marc Jacobs! 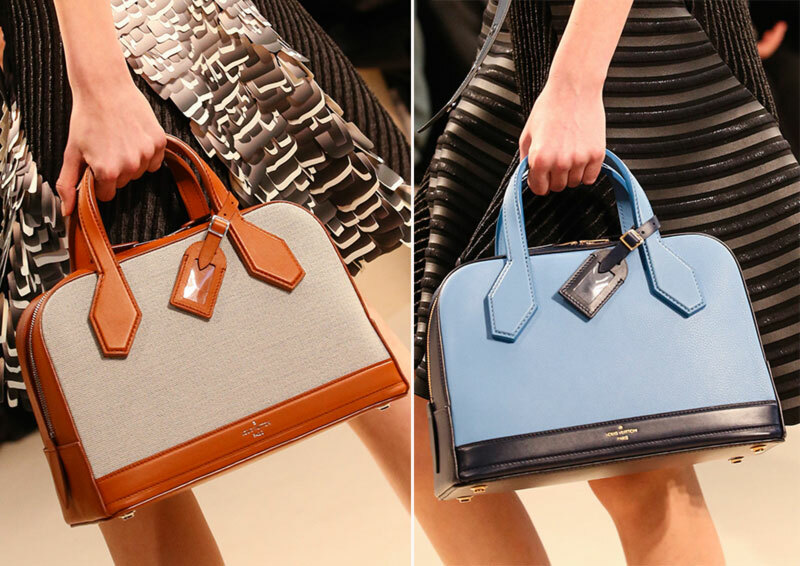 The absolute state of grace imagined by Nicolas Ghesquiere in the clutches/envelopes new series for Vuitton is mesmerizing! 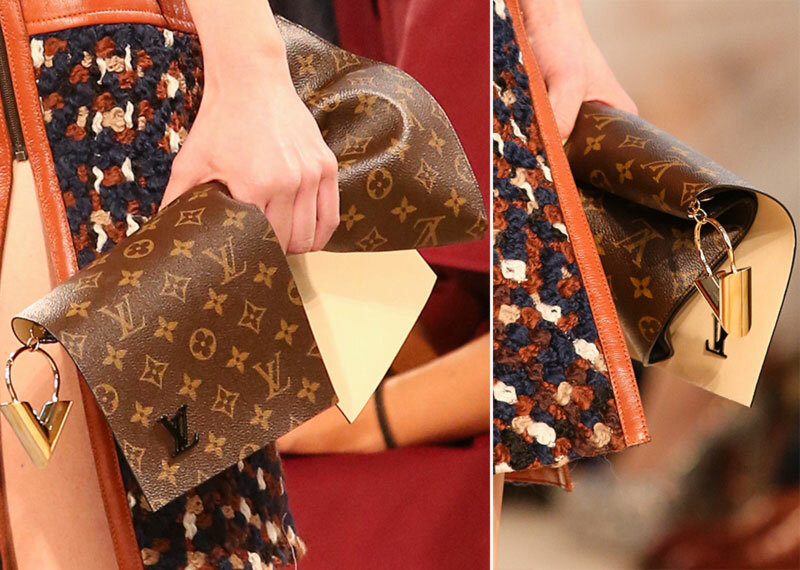 Looking more like separate patches of leather, remains from the making of glorified LV bags, the clutches incorporate the distinct monogram print but also a dangling golden V(which could very well be an L also). 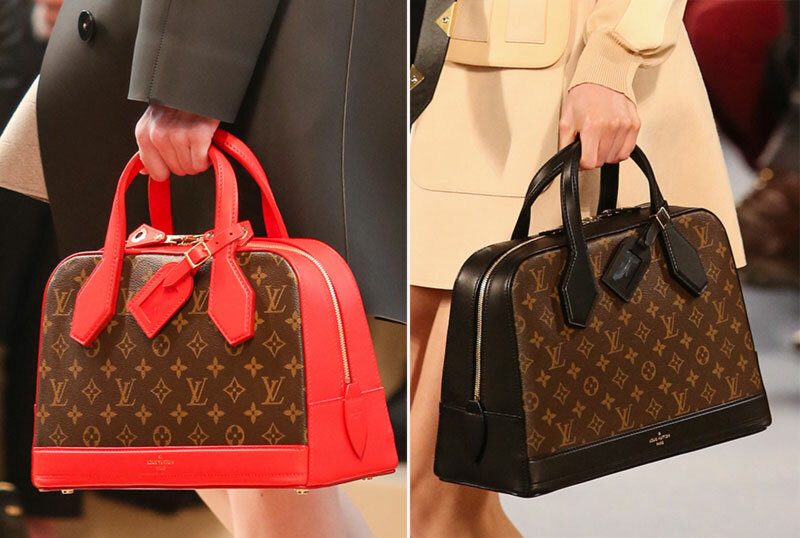 this is where all the other Vuitton bags reunite, as newly designed by Ghesquiere. 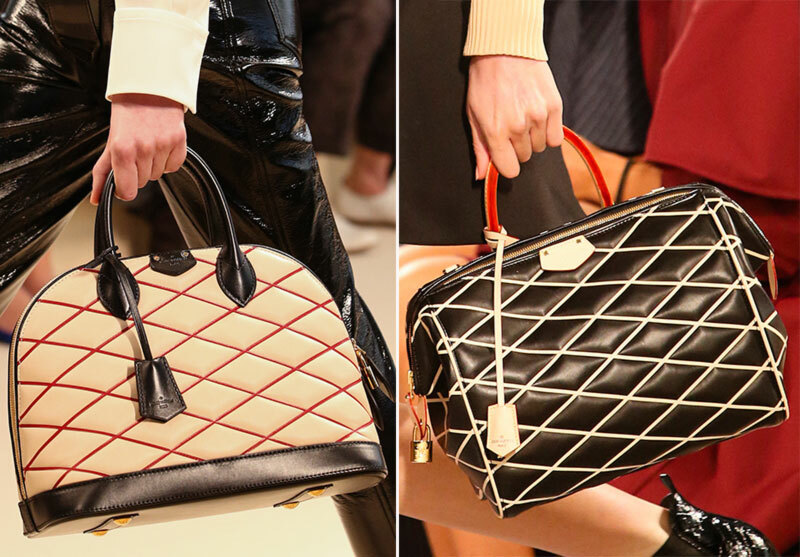 Quilted, structured, colored, in canvas or in leather, they’ll take the Vuitton name further onto dazzling heights of profit. 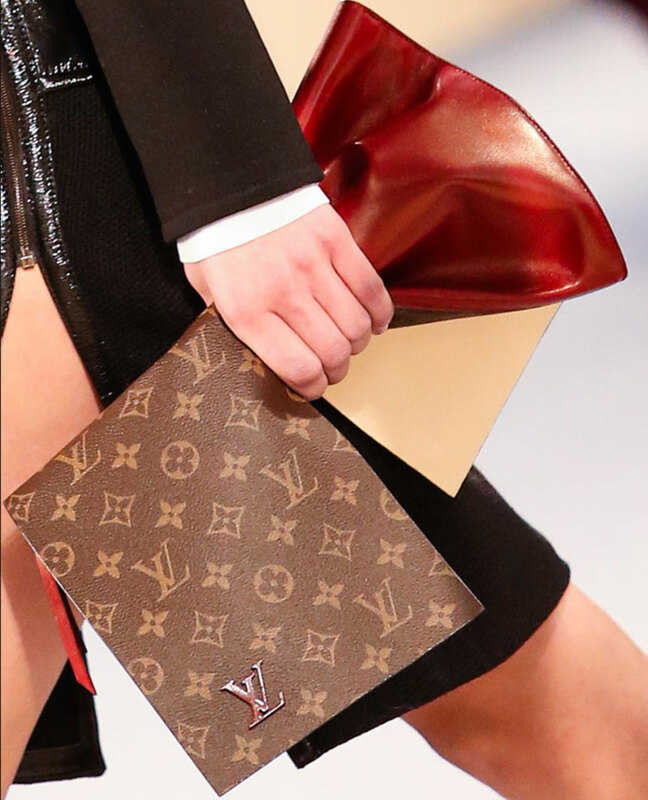 Oddly pieced and held together by yet another golden plate with the same V, this could push the monogramming to a new minimalist border under Ghesquiere’s reign. 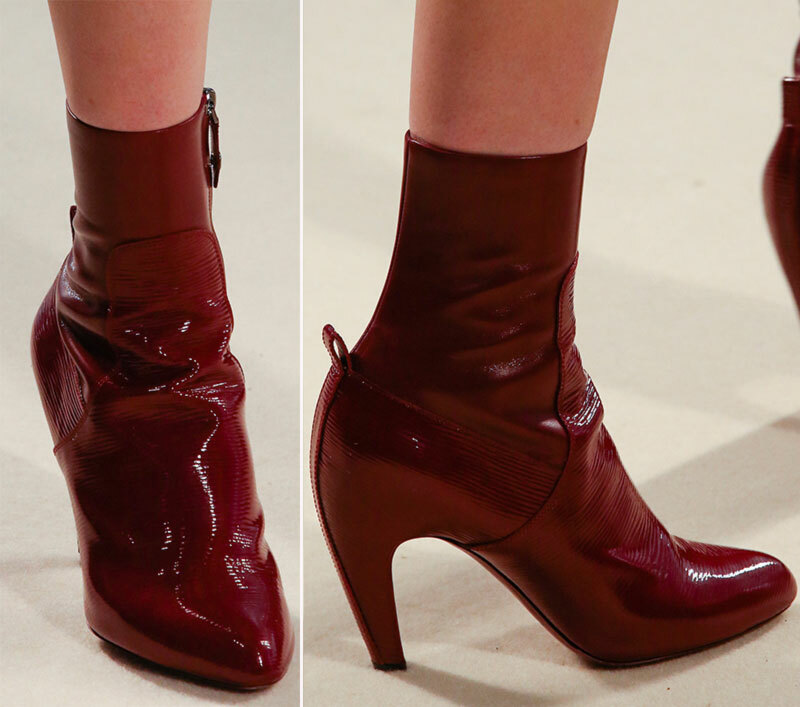 I noticed two types of ankle boots in the Fall Winter 2014 Louis Vuitton Collection: The 60es ones and the ‘new ones’. 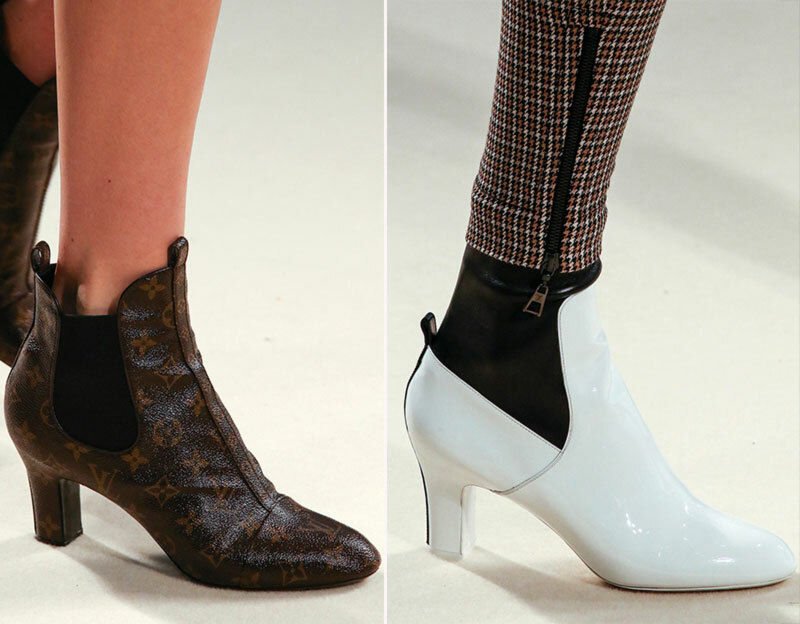 The first series, rising on a square mid-height heel is more about precious, exotic leather than actual design innovation (call it Vuitton’s Chelsea boot interpretation). 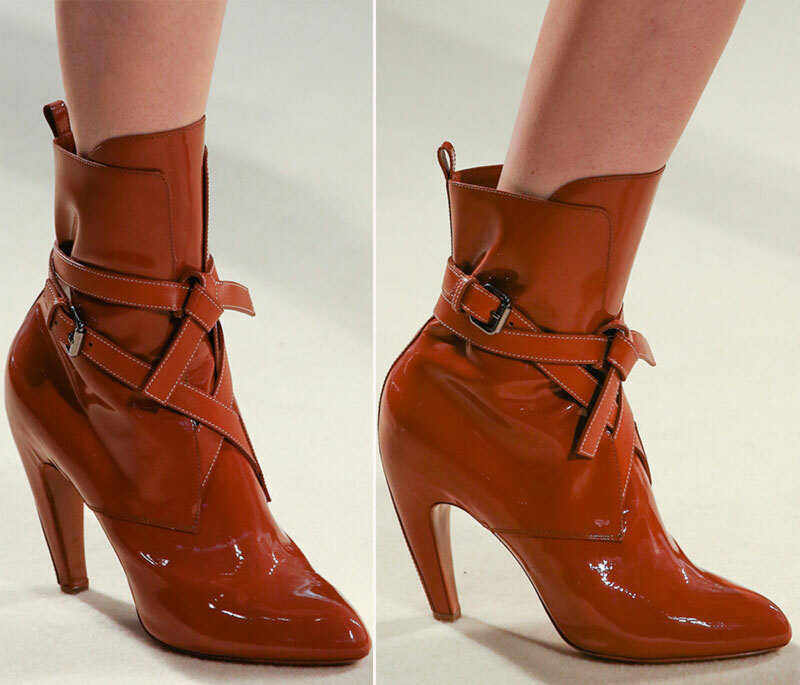 The second type of ankle boots, however, caught not only my eyes but also my heart! 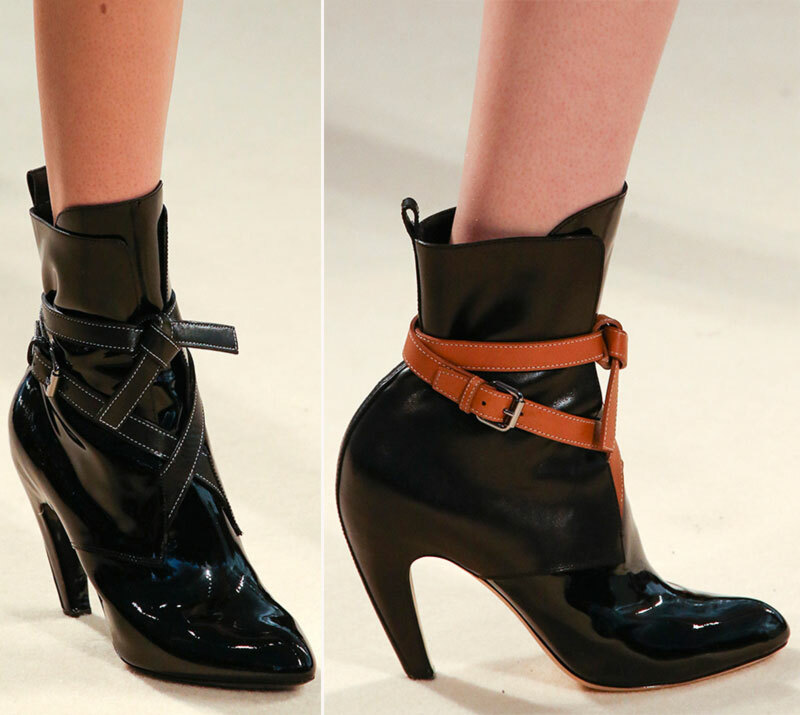 See more: Fall 2014 boots from Tom Ford! It was a big deception for me. I didnt like it I was expecting much more from him. Silly me. The 60ies had its grace and its importance well, at the 60ies..
You know, I too was expecting a bit more from him. And if I were to interpret his expression (from the first picture) I’d say he wasn’t too satisfied himself.. But will we ever know? Nicolas’ job is to satisfy Bernard Arnaud and his accountants. Guess he did after reading all the very enthusiasm “love it”…..”gorgeous”,,,,,”need this!”……”omg”…..and more comments like that everywhere. I’m not talking about people who really feel fashion. Lots of people confuse the difference with great clothes and fashion. Nothing wrong with loving nice clothes, don’t get me wrong! But there’s a difference not many people seem to understand fashion anymore. Or it has just disappeared for good. But if anyone would join me I would love to do that city trip!